Under a general anesthesia with muscle paralysis and assisted ventilation, the patient is put in a supine position with the head tilted downward. Pneumoperitoneum is performed by inserting the pneumoperitoneum needle (Veress needle) off the midline lateral to the rectus sheath at the umbilical level. The pneumoperitoneum needle is then replaced by the port sleeve of the scope and the gas insufflation tubing is transferred to this port. A 5-mm laparoscope is recommended. A small vertical incision is made on the opposite side of the abdominal wall at the umbilical level. 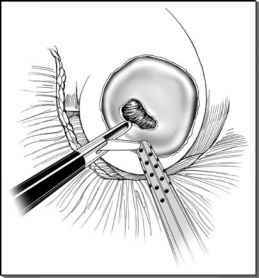 An additional port (surgeon preference) is inserted through the rectus muscle along the incision with the patient in a Trendelenburg position and at an angle of 45° in the caudal direction, making the peritoneum entry 2 to 3 cm below the umbilical level. The point of penetration through the anterior rectus sheath is more cranial than the penetration point of the posterior rectus sheath. The caudally angulated passage through the abdominal wall encourages the peritoneal dialysis catheter to remain oriented in a pelvic direction. Insertion of the continuous ambulatory peritoneal dialysis catheter into this port allows adjustments to the distal cuff above the peritoneal layer under laparoscopic control.